24 March19.00 in Moscow Journalist House will play instrumental duet Dmitry Tatarkin(guitar) and Vera Trusova(domra). Evgeny Baev's works will be performed. Evgeny Anatolyevich Baev was born in 1952 in the town of Pervouralsk (of Sverdlovsk, now Ekaterinburg region). In 1972 he graduated from Sverdlovsk(Ekaterinburg) Chaikovsky musical college(the class of guitar of Derun Vitaly Mikhailovich, who is considered to be one of the founders of guitaristics in Russia). In 1977 Evgeny Baev graduated from Mussorgsky Ural State Conservatory in Sverdlovsk(Ekaterinburg). 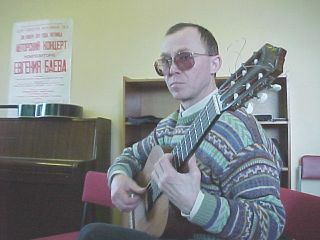 He was taught classical guitar by Alexandr Vasilyevitch Mineev(at day department). 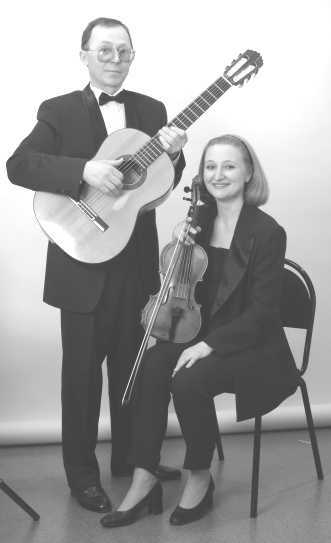 In 1988 Evgeny founded an instrumental duo "Musical miniatures" (a violin and a guitar). Until now the duo has given more than 100 concerts, performing in Germany, Finland, Latvia, France, Italy, the USA.Evgeny Baev's activity as composer is highly fruitful.He composed 10 sonatas for guitar solo, "Christmas suite" in 5 parts, "Malakhite casket", 5 Stikhiras(Stikhira is ortodox church songs), Retro suite, "The legend of Don Quixote" in 4 parts, 18 studies on non-traditional technique, Studies on the basis of Spanish flamenco, musical fairy-tale "Seven dwarfs and one more", concert play "Master and Margarita", 5 polyphonic pieces, 3 sonatinas, scherzo, serenade. The composer has developed a system of major and minor three-sounding, arpeggio. E. Baev arranged more than 30 Russian folk songs, 30 Latvian folk songs. Among the composer's arrangements there are Russian chants of the 17-18 centuries from the spiritual songs "To all the Saints in Tver region glorified", 13 musical church pieces. For the duo "Musical miniatures"(violin-guitar) Baev composed 2 sonatas, 14 pieces for children of junior classes, suite "Children's dreams", suite "Golden key" in 9 parts, suite "Contrasts", Spanish folk suite, American folk suite, Jewish folk suite, Russian folk suite. Evgeny composed for other instruments: 3 concerts for balalaika; the sonata for domra and piano, introduction and hota for violin, viola and guitar; concert for 2 guitars, flute and orchestra; pieces "At the theatre", waltzes "Bluebell" and "Fire-fly" for the ensemble of violins and piano; the author refined 14 different ethnic melodies for domra and guitar. From 2001 Baev's works have been published in Italy (the edition VP Music Media), Denmark (www.sheetmusicnow.com). In the review of British journal "Classical guitar" there have appeared favourable replies on his works. Presently Evgeny Baev teaches guitar in Tver State University, Tver music college, music school � 1 of Tver. He trained 20 laureats of the All-Union Contest, 2 prize-winners and 10 diplomaed of International competitions. Evgeny himself is diplomaed of the International Festival in the USA(Buffalo) in 1993; a diplomaed of the International composer's competition devoted to the 2000 anniversary of Christianity in Russia (Moscow, 2000).